Change has come to golf fashion in the last few years with bright colors beginning to dominate the course rather than the muted colors typically associated with golf. But neither John Daly with his loud pants nor Rickie Fowler’s signature neon orange garb were the first to usher in this trend. 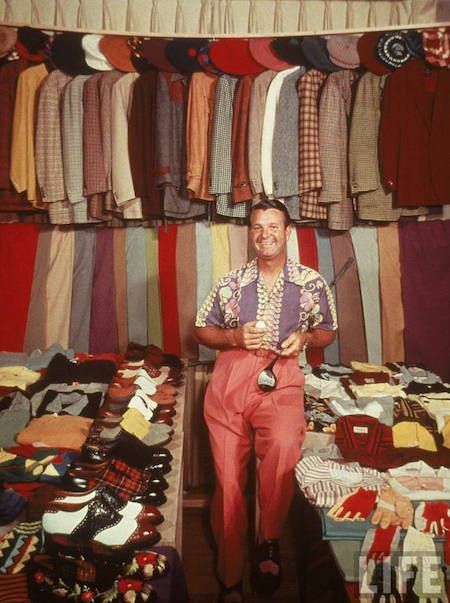 “The Wardrobe”, as he came to be known, Jimmy Demaret was a fan favorite. In an era where going without either tweed or a tie was out of the question, Demaret would show up in wild colors with matching shoes, sporting a large colorful tam atop his head. His explanation was simple. As a child, his father painted houses, and as he allowed young Jimmy to help mix paints, a fascination with color was born. Not only was Demaret making a fashion statement, he was also playing an amazing golf game. In 1940, he took home the green jacket and won five other tournaments. Paul Runyan said of him, “He was the life spirit of our tour. An attention-getter of the first order. He was everybody’s friend and extremely popular with his peers. But if his golf game, attire, and lovable spirit weren’t enough to win fans and players alike over, he was a songbird. His fellow tour members remembered in “The Masters” by Curt Sampson, the sights and sounds as Demaret crooned in the Bon Air hotel, a favorite golfer hangout in the 1940s. A legend on and off the course, Demaret was elected to the World Golf Hall of Fame in 1983, an in 2000, Jimmy Demaret was ranked as the 20th greatest golfer of all time. To purchase "The Masters" or any other books by Curt Sampson, visit this link https://www.amazon.com/Curt-Sampson/e/B000AQ0N24/ref=sr_ntt_srch_lnk_1?qid=1472070428&sr=8-1.